Oh my, the cover is so gorgeous I feel quite weak at the knees! Liz Grzyb and Talie Helene, the eds, have done a fabulous job and the ToC is really rather swoonworthy! The editors will soon begin reading for the second volume of The Year’s Best Fantasy and Horror — visit the Ticonderoga Publications website for more details. 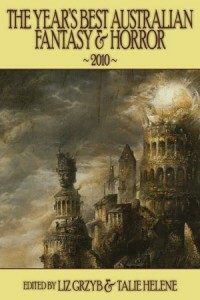 The anthology is scheduled for publication in June 2011 and will be available in hardcover, ebook and trade editions. You can pre-order this book at http://indiebooksonline.com. This entry was posted in News and tagged Liz Grzyb and Talie Helene, Maxine McArthur: “A Pearling Tale” Kirstyn McDermott: “She Said” Andrew McKiernan: “The Memory Of Water” Ben Peek: “White Crocodile Jazz” Simon Petrie: “Dark Rendezvous” Lezli Robyn: “Anne-droid of Gr, RJ Astruc: “Johnny and Babushka” Peter M Ball: “L’esprit de L’escalier” Alan Baxter: “The King’s Accord” Jenny Blackford: “Mirror” Gitte Christensen: “A Sweet Story” Matthew Chrulew: “Schubert By Cand, The Year’s Best Fantasy and Horror, ticonderoga publications. Bookmark the permalink.